The rear naked choke is a crucial attack, it involves the term ‘rear’ because it is applied from behind of the opponent and the word naked comes from the fact that unlike other techniques it does not include a training uniform or an object to apply it. If it is executed correctly, it is the ending point in a fight. This choke is also referred to as the “King of all chokes”. 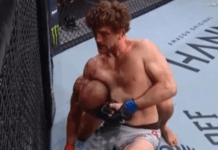 Many of the UFC submission triumphs have been rear naked chokes. This hold is one of the best submissive holds in the jiu-jitsu arsenal due to the positions that it can be applied. For an instance, suppose that the rear chokehold has been applied on an opponent, at that very moment, the opponent has no position or moves to attack. Only in the extremely rare case is it possible to break the lock after a couple of hard fought tries. However, it gets even harder on an experienced grappler. The rear naked choke has been around since the early years of Jiu-Jitsu. The Hadaka jime translates for ‘naked choke’ as to explain this choke does not require the use of GI-kimono. The popularity of the rear naked choke in MMA and Jiu-Jitsu is attributed to the Gracie family, who popularized the choke in no holds barred fights. The association between the choke and the lion killing capabilities can be dated back to as far as the early 1500’s. It seems as though the name was mata-leao only started being used in Jiu-Jitsu and vale-to-do in 1960’s decades. The attacker’s right arm encircles the opponent’s neck, making sure the opponents trachea is at the crook of his elbow. The attacker’s right hand then grabs his own bicep (upper left arm). To apply the deadly pressure on the neck, from the radius bone and the biceps, the attackers has to bring both elbows together and join them. A variation that involves clasping of the hands, this is also known by “Palm to Palm”. It allows more pressure to be applied to the neck. It modifies the original move but the idea is to put pressure on airway and stop opponents breathing. This choke is done from back control and leg placement has two variations, standard back control with hooks or body lock. The body lock is executed by placing one of your legs on the opponent’s chest. Then place the leg on his own shin creating a figure four with legs. This allows you to limit opponent’s movement and stay close to him. To start off, you need to be behind your opponent. Now let’s assume you are right handed, the next thing you need to do is to get your arm around the opponent’s neck. Your right hand should be on the bicep your left arm. The left arm should then move to the back of his/her head, down enough so they cannot find a way to displace your hand. Next, grab your opponent’s right shoulder with your left hand. Your fingers should be in a claw like shape as they grasp the back of their right shoulder. This enables you to make your grasp stronger. Afterward, move your right arm from your opponent’s armpit; put one of your hands in the other. This is a strong position since your arm is against your opponent’s back. Your opponent might try to block the choke now, using your left hand get a grip on the opponent’s shoulder. Simultaneously, use your right hand to push away their hand off your arm, giving resistance to any chances of them breaking the choke. Do this part very quickly and cautiously since your opponent may take this as an opportunity to grab your hand and dismiss the choke. The rear choke hold effectively trips the jugular vein, the greatly stops the flow of blood from the head or brain to the heart. This causes unconsciousness sooner and the opponent begins to fade. When pressure is applied to the opponent’s neck, the heart will gradually reduce the heartbeat speed which will cause lesser blood flow from the heart. This choke could lead to a malfunction of the flowing of the blood towards the heart that may or may not be fixed ever. The time of the pressure is proportional to the damage of cerebral anoxia, which means cutting off the oxygen supply to the brain. Can You Lose Weight with BJJ?